Geo-Solutions and Geo-Con merged in December 2012, retaining the name of Geo-Solutions. Geo-Solutions is a specialty geoenvironmental / geotechnical contractor founded by construction minded individuals with technical backgrounds. The senior staff have been in the forefront of numerous construction technologies including soil mixing, jet grouting, slurry walls, bio-polymer collection trenches, and other grouting services for nearly four decades with many individuals having worked together for over 20 years. We hope you find this short history of Geo-Con and Geo-Solutions interesting. If you know of additional details that you feel would add to the history below, please contact us at info@geo-solutions.com so that we may consider your additions / edits. In 1956, Elio D’Appolonia started Elio D’Appolonia Consulting Engineers (EDCE) after stepping down as a Professor at Carnegie Tech (now Carnegie Mellon University). EDCE would later become known as D’Appolonia. Spin offs from EDCE include Paul Rizzo and Associates, PDG Environmental, Ground Improvement Technology, Geo-Con, and others. D’Appolonia Consulting Engineers formed a geotechnical construction subsidiary called Engineered Construction International (ECI). Chris Ryan, P.E. (Founder of Geo-Con and Geo-Solutions) heard about the upcoming formation of ECI in December 1972 and moved to Pittsburgh to become the first employee. Once ECI officially formed, the company immediately formed a joint venture (JV) with Soletanche. ECI acquired Allied Asphalt which brought Eddie Mehalic (mechanic and yard manager) and Mine Grouting equipment to the firm. David D’Appolonia moved to Pittsburgh to become the President of ECI. Chris Ryan left ECI and recruited Jim Williams (co-founder of Geo-Con). They met to discuss starting a company in March of 1979. The name “Geo-Con” is selected at the first meeting. Geo-Con originally operated with Chris as the only employee. At the end of 1979, Jim officially joined Geo-Con as an employee and managed its financial operations for the next 17 years. 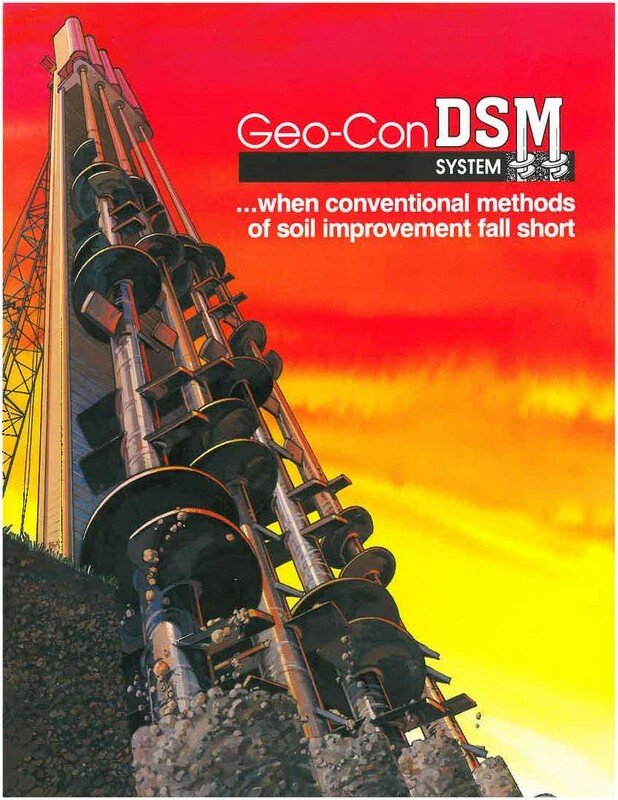 Geo-Con produced its first sales brochure in 1979. In 1980, Geo-Con moved into its first real office, a room rented from Menard at its Monroeville, PA office. George Koelling joined the company and established a Dallas office. Ed Mehalic joined the company around the same time and started to manage the equipment and yard facilities. Ed continued to work for Geo-Con and then Geo-Solutions until his retirement in 2016 (over 34 years). In 1981, Dave McIlrath and Ken Andromalos joined Geo-Con. Dave started as a yard helper (currently senior lead Equipment Specialist for Geo-Solutions) and Ken as a Project Engineer (currently the Vice President of Engineering for Geo-Solutions). After completing his studies at the University of Texas, Steve Day joined Geo-Con in 1984 and helped advance Geo-Con into the slurry wall business. Except for a short period with Inquip Associates, Steve spent the next 30 years of his career working for Geo-Con and Geo-Solutions until his retirement in 2016. During this time, Geo-Con experienced solid growth and added sales offices in Philadelphia, Chicago, IL, San Francisco, CA and Lakeland, FL. Geo-Con quickly established itself as a strong leader in the installation of slurry walls, the grouting of abandoned mines, installation of dam grout curtains, compaction grouting, excavation support systems, and high capacity ground anchors. To support this work, Geo-Con internally developed specialized, large, long boom/stick excavation equipment for their slurry wall work and some of the first grout instrumentation and automation equipment in the industry. In 1986, Taisei Corporation made a financial investment to become a minority partner in Geo-Con. Taisei was one of the largest international contractors in Japan with sales approaching $10 billion. Chris had met them while working on the first non-structural slurry wall ever constructed in Japan and approached them about making an investment in Geo-Con. Taisei brought financial strength and access to Japanese foundation technologies, most notably, deep soil mixing. 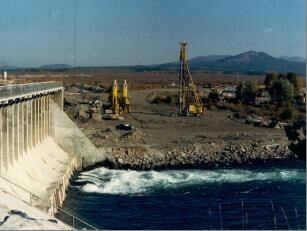 In 1987, one of Geo-Con’s premier projects, the Jackson Lake Dam Project, was completed using a Japanese company SMW Seiko as a partner. The Jackson Lake project was the first use of deep soil mixing (DSM) in the US and ushered in a new era of soil mixing on the North American continent for geotechnical and environmental applications. Geo-Con DSM advertisement wins top ten design contest in Engineering News Record (ENR) magazine. Used soil mixing for an environmental remediation application. Designed and built the first U.S. manufactured multi-auger DSM soil mixing rig. Performed one of the first significant jet grouting projects in the U.S. Designed and built the first U.S. manufactured dual stem jet grouting drill rig. Installed a large environmental rock grout curtain which was the largest application of micro-fine cement based grout in the U.S. at the time. Demonstrated the use of the DSM technology to contain PCB impacted soils at a site in Florida as part of the U.S. EPA Superfund Innovative Technology Evaluation (SITE) Program. Utilized DSM technology to create an environmental barrier for chemical warfare materials at the Rocky Mountain Arsenal in Colorado. Performed the first installation of large diameter, single auger soil mixing (also known as Shallow Soil Mixing or SSM) which created one of the mostly widely used techniques for the environmental soil remediation market known as In-Situ Stabilization/Solidification (ISS). Developed and pioneered the use of biopolymer slurries for use in slurry trenching to create deep collection trenches and allow for development of another new technique in conjunction with the University of Waterloo and Envirometals Technologies known as Permeable Reactive Barriers (PRBs). In March of 1993, Bob Schindler joined Geo-Con as an Operations/Project Manager. Bob had previously worked as a construction manager for Gundle Lining (now GSI) installing geosynthetic liners for landfill cell construction and closure. Geo-Con continued to have strong growth and reached an annual revenue of $45M (approximately $75M in 2017 dollars) in 1995. In 1994, the firm began a search for a strategic investor to help the company take its next big step. The search culminated in the acquisition of Geo-Con by Woodward-Clyde, the premier geotechnical consulting firm of the time. For a number of reasons, the merger proved unsuccessful and Geo-Con’s s sales volume suffered. In 1996, Chris Ryan separated from Geo-Con. Geo-Con / Woodward Clyde eventually go on to be acquired by URS, which was subsequently acquired by AECOM. Shortly after the acquisition by URS, Geo-Con was sold off to a capital venture firm and then to several of its employees which ran the company until it was acquired by Geo-Solutions in 2012. Shortly after leaving Geo-Con, Chris Ryan started Geo-Solutions, Inc.
Geo-Solutions was officially incorporated in March 1996. Chris was the founder and original partner. Ed Mehalic re-joined Chris and resumed his role as yard and equipment manager for Geo-Solutions. The new firm primarily provided technical assistance and consulting services from 1996 to 2003. Bob Schindler moves to Tampa, Florida to re-establish Geo-Con’s Southeast office. Steve Day joined the Geo-Solutions as Vice President and the second partner. Steve opened a Denver, CO office. Bob Schindler relocates back to Pittsburgh, PA to take on role as Geo-Con’s Vice President of Operations. Geo-Solutions began working internationally with work in Brunei, a tiny nation on the island of Borneo, surrounded by Malaysia and the South China Sea. Pete Maltese leaves Geo-Con to take a position with CRA (now GHD). Ken Andromalos leaves Geo-Con to take a position with Brayman Construction. Bob Schindler joined Geo-Solutions as Vice President of Eastern Operations and as the third partner. Later in 2003, Geo-Solutions moved to a construction trailer in New Kensington, PA at the site of its new office. Operations in 2003 were conducted out of the construction trailer until the new office construction was completed in late 2003. Shortly thereafter, Geo-Solutions started to bid and perform turnkey construction work and also began working in Canada. Geo-Solutions started working in Australia through a long term agreement with a local Australian contractor. Geo-Solutions made a major investment (for Geo-Solutions at that time) in the soil mixing market with the purchase of a Delmag RH-18 drill rig. John Thall, a former Geo-Con employee and associate of Geo-Solutions principals, joined Geo-Solutions as the Operations Manager, a position that John still holds. Based on reoccurring client needs, Geo-Solutions established a Canadian subsidiary (Pennsylvania Geo-Solutions). Pete Maltese (another former Geo-Con employee) joined the company as a Senior Project Manager and the fourth partner. Pete immediately started managing Geo-Solutions’ larger projects, including the keystone project at the Watkins Dam Reservoir in Utah which was completed in late 2008. 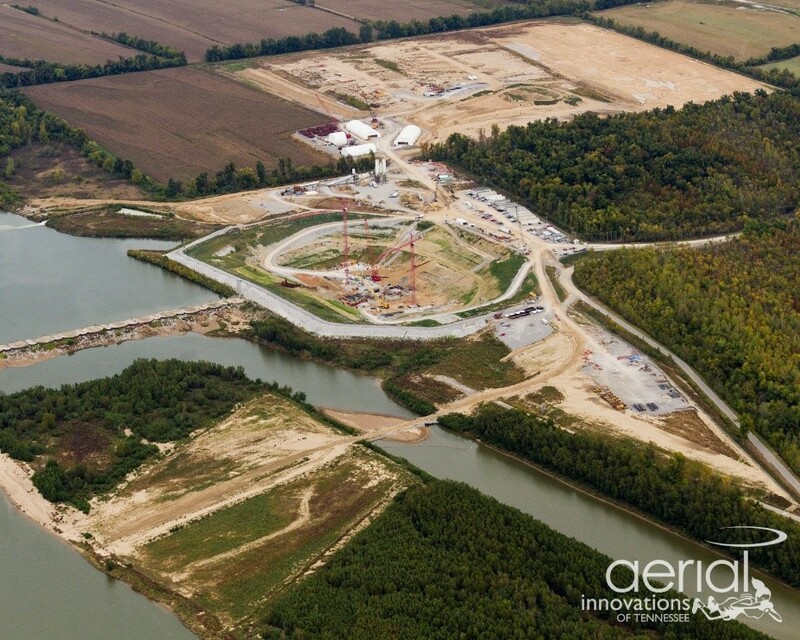 This project was Geo-Solutions largest project to date and put Geo-Solutions on the map. Geo-solutions is awarded the US Bureau of Reclamation Safety Award for the Watkins Dam project. After earning his B.S. and M.S. degrees in Civil and Geotechnical Engineering at Bucknell University, Dan Ruffing, P.E. joins Geo-Solutions as a Project Engineer. 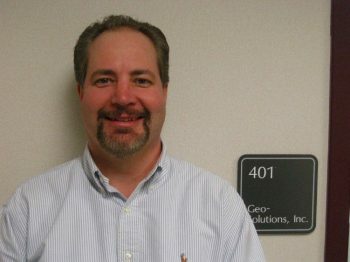 Dan is now the Engineering Manager for Geo-Solutions working out of the New Kensington, PA office. Ken Andromalos, P.E. re-joined his former colleagues at Geo-Solutions as the Technical Director and fifth partner. Another keystone project in Smithland, KY was completed. 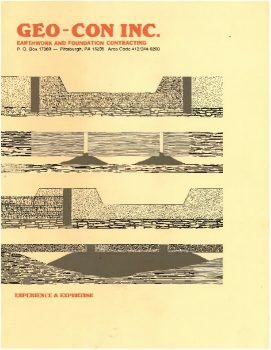 The Smithland slurry trench cutoff wall remains the deepest continuous soil-cement-bentonite slurry trench cutoff wall ever installed with a maximum depth of 185’. Construction of a larger office space (tripled shop space and doubled office space) in New Kensington was completed. Geo-Solutions began working in Brazil through a 5 year agreement with Brasfond, the largest specialty foundation contractor in Brazil with the goal of assisting Brasfond with establishing the new emerging environmental market in Brazil. Geo-Solutions first projects with Brasfond included two firsts for the Brazilian market, the first permeable absorptive barrier (PAB) at an active chemical facility near Sao Paulo and the first test program for environmental soil mixing at an in-active facility in Rio de Janeiro. Geo-Solutions brought in RAF Industries to provide financial support for the eventual retirements and exits of Chris Ryan and Steve Day. In December 2012, Geo-Solutions acquired Geo-Con and began merging operations under the Geo-Solutions name. The Geo-Con acquisition brought a significant amount of experience in the form of long-time Geo-Con employees, all of whom are still with the company today. Chris Ryan stepped down from President of Geo-Solutions to serve as the Chairman of the Board and Steve stepped down from Vice President of Western Operations to serve as a Director. Brian Jasperse, P.E. stepped down from the President of Geo-Con and formally retired. Bob Schindler assumed the role of President and CEO, Pete Maltese assumed the role of Vice President of Operations, and Ken Andromalos assumed the role of Vice President of Engineering. Two additional Vice Presidents came over from Geo-Con, Paul Cannon (Contracts) and Jim Brannigan (Projects), to complete the executive team. 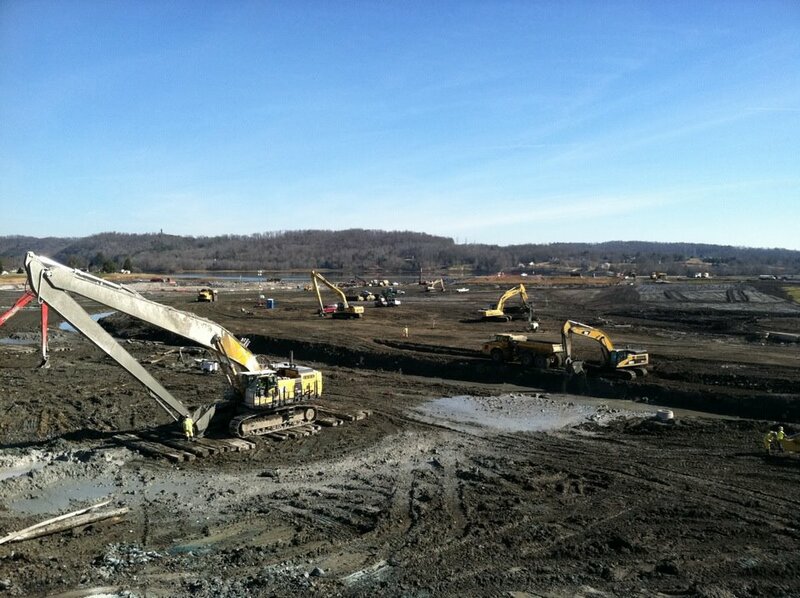 In order to accommodate the Geo-Con employees, a large expansion of the New Kensington facility began early in the year and was finished by the end of the year. This expansion doubled the available office space. Additional yard space is acquired at two vacant lots located nearby in New Kensington, PA.
Geo-Solutions completed the installation of the Perimeter Wall Stabilization at the Kingston Ash Recovery Project. This contract was carried over from the Geo-Con contract with the client. The Perimeter Wall footprint forms a continuous boundary of approximately 11,500 feet around the property and includes more than 12 linear miles (560,000 cubic yards or 3,780,000 vsf) of slurry trench, making it the largest Cement-Bentonite slurry wall installation in U.S. history. Geo-Solutions installed a cutoff wall for the Graving Dock Construction at Husky Energy’s White Rose Extension Project in Argentia, Newfoundland. 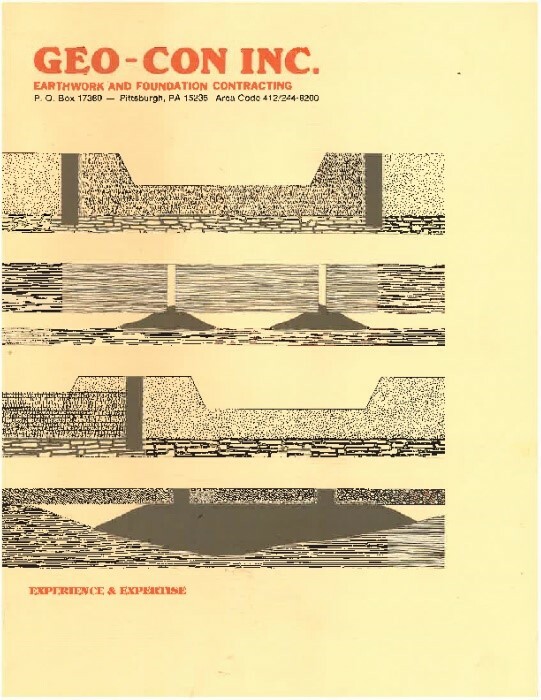 The SCB cutoff wall was installed through porous soils/boulders to prevent groundwater seepage of the adjacent Atlantic Ocean from entering into an open excavation. The excavated area inside the cutoff wall was taken to approximately 21 meters (70 feet) below the elevation of the ocean water and is being used to construct the foundation for an offshore oil well platform. In order to better support our clients and our regional managers, Steve Artman and Darin Payne, Geo-Solutions opened offices in Lakewood, Colorado and St. Petersburg, Florida. This enabled Geo-Solutions to further strengthen their position in the western and southern regions and a greater ability to serve their clients. 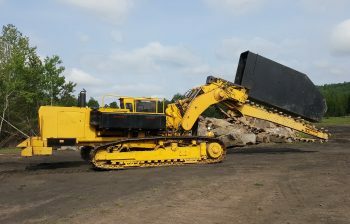 Geo-Solutions added the Geo-Trencher to its equipment fleet. The Geo-Trencher provides an alternative installation method for vertical barriers, collection trenches and permeable reactive barriers. Mike Fisher, another former Geo-Con employee, joins Geo-Solutions as a Senior Project Manager. Mike immediately began managing the larger, multi-year projects. Geo-Solutions changed the name of its Canadian subsidiary from Pennsylvania Geo-Solutions to Canada Geo-Solutions.